When I first connected with Evan, little did I know that I was about to be exposed to one of the most generous and wisest people I have ever met. I was reaching out to him because I learned of his masterful ways in getting one's message out, and because I found out that we both share a common passion: Creating environments that foster and nurture children's innate gifts and self expression. 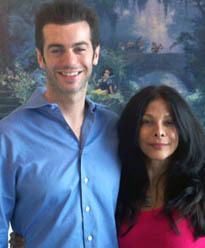 Evan does it through his web sites and his foundation; I do it through my web sites and my work as a psychotherapist. As soon as we began speaking, it was clear that we were kindred spirits. Evan immediately suggested we work together to support our shared vision. Within days Evan's Foundation moved into action to create and support a Facebook page for my organization, Discover Yourself. Within a few weeks his team garnered over 7,000 fans, and counting! All along the way, he and his team have been available to answer my questions and guide me every time I reach out to them. I have met many people in my life who speak the openheartedness and wisdom that Evan speaks, but only a handful who actually walk it. Thank you Evan." Discover Yourself was founded by Ronit Herzfeld whose work is devoted to recognizing, revealing and nourishing the Divine spark – the innate gift -- of each human being from infancy, and throughout life. Ronit is a psychotherapist, human rights activist and author. Discover Yourself teaches a practical self-awareness and philosophy that helps people find peace in their daily lives. Individuals discover the source of passion, strength and creativity they were born with.